Qabalah is a framework or system that has been hugely influential to many magical, mystical and spiritual traditions including Wicca and other modern pagan paths as well as the Golden Dawn, Thelema and Western Esotericism. It is very much connected to the use of tarot and astrology. I would say that a basic understanding of Qabalah is essential for anyone involved in any of the things I've mentioned above. However, it can be a complicated subject. A new book in the Hay House Basics range, Qabalah, by David Wells, sets out to explain the essential principles of the subject in an easy to understand way. Actually, introducing magical and spiritual subjects clearly and simply is the core premise of the entire Hay House Basics series. I've read many of the books in the series; they are generally excellent and this book is one of the best. I was also delighted to meet up with David at the recent Hay House Bloggers party. I got him to sign my copy of the book as well as taking his photo. 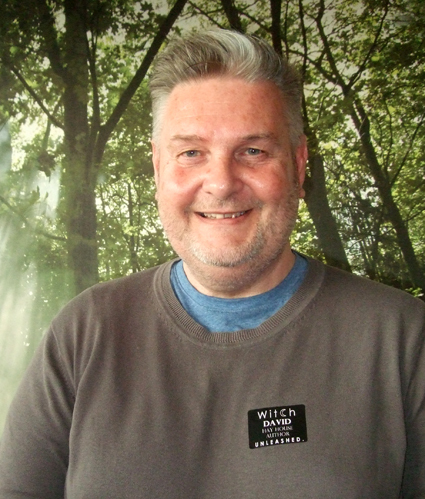 You can see it to the left - he is in front of a picture in the Hay House UK offices, not standing in a forest! David is a nice bloke, a witty and knowledgeable writer and a good teacher - I went to a workshop he ran on Qabalah at Witchfest a few years ago and found it very instructive. Discover Qabalah, a Western non-religious mystic tradition containing a body of magical knowledge and practices to help you embrace your higher self. In this book, you will learn, the role of the Tree of Life - the central organizational system of Qabalah, the meaning of each Sephira, or sphere, on the Tree, an exercise and meditation for each Sephira, how to work with and understand the symbolism of each Sephira, from Gods and Goddesses to crystals, how to increase the energy for your meditations and create a personal sigil, or symbol, to represent your highest values and how to use Qabalistic prayer and work with the four great Archangels for daily support and protection. As well as offering basic details about Qabalah and introducing the Sephira, in Qabalah David offers a series of meditations and exercises to start your own journey of personal development on the Tree of Life. He also explains how to use Qabalah to further studies of tarot and astrology. Qabalah can be ordered via Amazon.